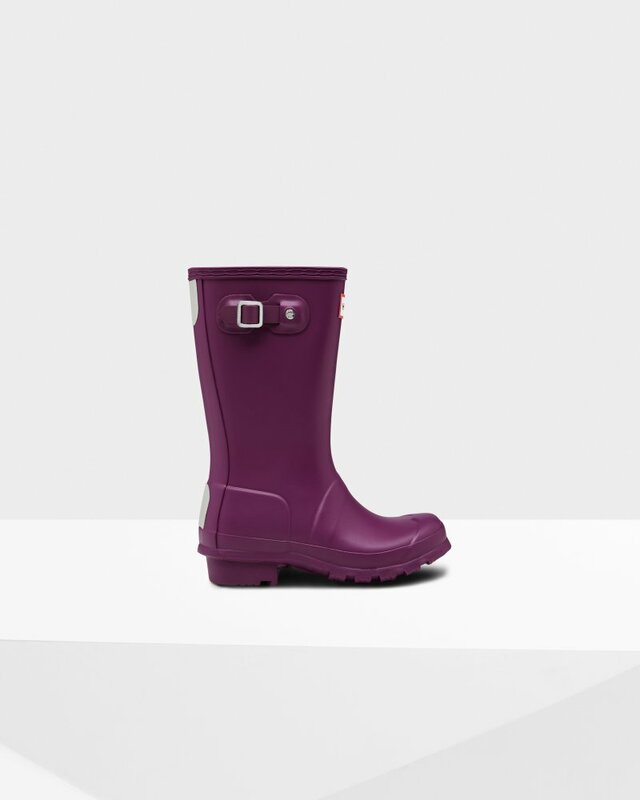 A mini version of the iconic Original Tall Boot, the Original Kids Wellington is a dream for junior explorers. This purple waterproof boot is handcrafted from natural rubber. Designed for adventures, our specialised kids wellies are highly resistant to wear and abrasion with a polyester lining for comfort. Reflective patches and the Hunter Original tread offer added safety so you can be confident letting them take on the elements whatever the weather. Rated 1 out of 5 by Sam_ from Don't last! I got these in October after much consideration. I walk a lot and work outside, and normally wouldn't spend so much on wellies but needed them to last... And as they are so popular and quite expensive I assumed they would last longer than 5 months. However I have rips in both sides of both boots meaning they're no longer waterproof and no good anymore. Rated 5 out of 5 by Partridge73 from A happy son Excellent children’s Wellington Boots, and my son loves them. Nice and tall compaired to other boots and all the better for wading into streams. Good colour range to choose from. The fit is perfect with welly socks and a well made British product. Rated 5 out of 5 by Anonymous from Very good Very good quality. Good material. I’m a size 4 and 1,56m tall and the original women’s boot would go too high on my leg so I ordered the kids boots and it looks just amazing! Rated 5 out of 5 by Laurabt87 from Love these! Bought as a Christmas present for my son, he’s over the moon with them. Perfect fit & they will certainly be worn until they are too small! Rated 1 out of 5 by BMM5 from No Kids wellies bigger than 36!!!! Size 4 turns out to be too small for my grandson and there is nothing bigger in Kids sizes. Why not?????? Adults wellies in Size 5 are too tall. Rated 5 out of 5 by Natma from Meet expectations Boots just perfectly meets expectations, not too high, but still not too short and still comfortable to put on/off. My fears that will be too massive or too wide also didn't realized.